At Automechaika 2018, spare parts specialist MS Motorservice International GmbH is showcasing its altered packaging design, which features a modified logo and new colors. While changing the optical appearance of its packaging, the company also adopted additional measures to combat product piracy: The latest generation includes security features on the labels that offer an even greater protection against counterfeiting. “We’re very pleased to have successfully completed our logo revamp. The new packaging definitely gives us a fresher, more up-to-date look”, declares Sven Zeitler, head of marketing at Motorservice. “And what better place to unveil it than Automechanika?” The new packaging will be on show at the sector’s premier trade fair in Frankfurt am Main, September 11-15, 2018. 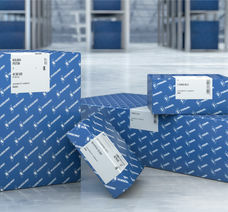 However, the company’s customers may have to wait a while before getting their hands on the new design: Motorservice will be shipping previously ordered and packaged products in the original packaging until supplies run out. “It could well be that the complete changeover won’t take place until 2019”, says Zeitler. As a supplier of OEM-quality engine components, Motorservice goes to great lengths to make sure its products aren’t counterfeited. In the process of changing the design, the company therefore decided to employ the latest generation of security features: the tesa PrioSpot, developed by tesa scribos. This anti-counterfeit product identification system contains a variety of visible and concealed security features. Some can be seen with the naked eye, while others require a magnifying glass or special scanner. Thanks to this patented technology, up to seven different verification levels can be simultaneously inscribed on the label, giving the product a unique identity. In addition, the 2-D matrix code on the label has been replaced with a QC code. This makes checking the authenticity of the product quick and easy: all you have to do is scan in the QR code with a smartphone, and seconds later a green light appears on the display if it’s an original product, or a red light if it’s a fake. You can find here the new safety features and an updated online-check. The Motorservice Group is the sales organization of Rheinmetall Automotive’s global aftermarket activities. It is a leading supplier of engine components for the spare parts market, encompassing the Kolbenschmidt, Pierburg, BF and TRW Engine Components brands. An extensive, in-depth product range lets customers draw all their spare parts from a single source. Moreover, as a problem-solver for wholesalers, retailers, and auto repair shops, Motorservice offers a level of comprehensive technical expertise befitting the subsidiary of a major high-tech enterprise.